In bypass patients, the incidence of subsequent heart attack or myocardial infarction is higher than for those treated with medication. More than 500,000 heart patients have received intravenous EDTA Chelation Therapy over the past thirty years. Published studies have established the efficacy rate at about 85%. It not only clears blocked heart arteries but improves circulation throughout the body for long-term benefit. 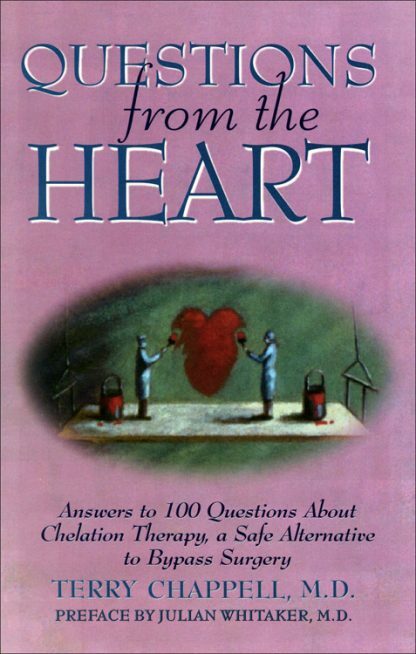 In Questions from the Heart, Dr. Terry Chappell answers 100 of the most commonly asked questions about EDTA Chelation Therapy, comparing benefits and drawbacks to both therapies in a concise, easy-to-read format. Ideal for all levels of inquiry.